White Cheddar Meatballs are perfect for dinner or as an appetizer. 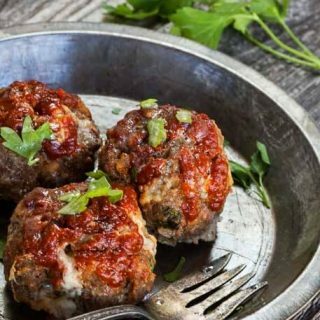 These healthy baked meatballs have a delicious crunchy exterior and a tender cheesy center that contrasts perfectly to the sweetness of the bbq sauce glaze. They’re guaranteed to disappear in a jiffy. I don’t know of anything that says comfort food like meatballs. You can make them large for the main meal, or smaller for an appetizer. Another benefit is that you can make a small number or a large number and freeze them. 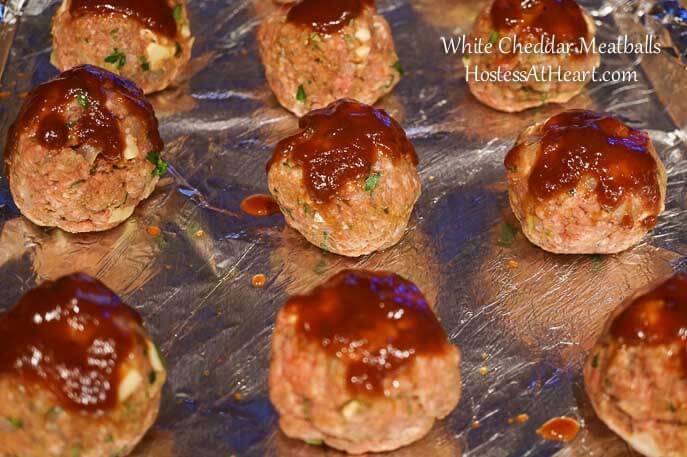 Regardless of the occasion, you’ll love these Stuffed White Cheddar Meatballs. Baked Cheddar Meatballs are something that I put together when I was losing weight. Out of a pound of meat, I made 12 healthy meatballs. Instead of cutting a big ole slice of meatloaf I can have pre-portioned meatballs. 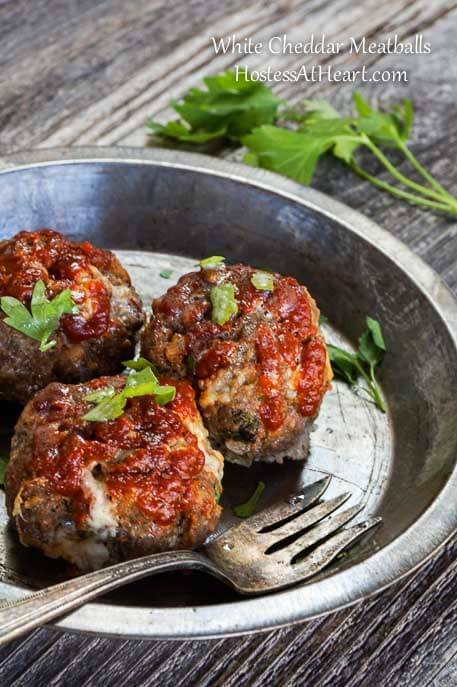 Served with a side salad or fresh veggies, these stuffed meatballs make a delicious meal. 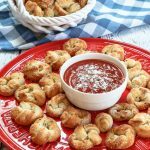 You can also make them mini size and serve them as an appetizer. These meatballs are so good that they don’t need to be drowned in sauce, and they’re so easy to put together. Best of all, they are baked in the oven. I toasted Italian breadcrumbs and browned the onion instead of adding it raw which gives this dish a deeper richer flavor. All of the ingredients were combined in a large bowl. Form the mixture into a square and divide it into 12 even pieces. Some may have been a little smaller than others. I’ll give those to John. He will not know. 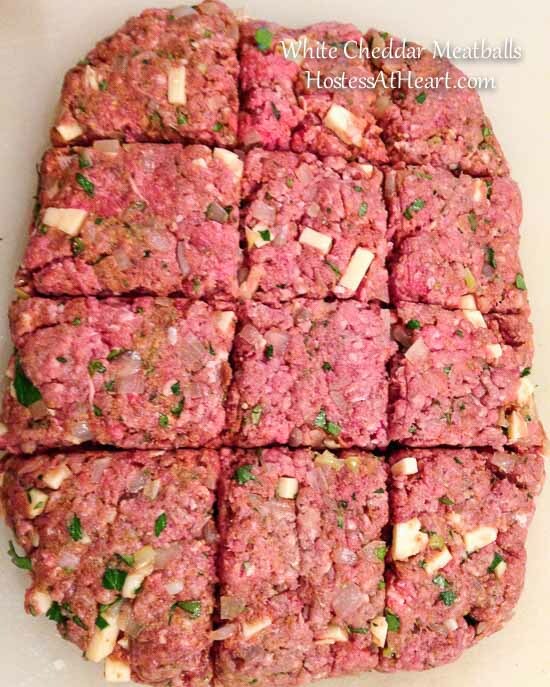 Roll each square into a ball and place the meatballs onto a foil-lined baking sheet. 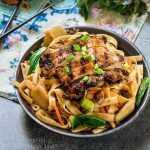 Don’t forget to pin this great recipe to your favorite Pinterest Board! Here are a couple other amazing meatball recipes! OXO Good Grips Medium Cookie Scoop – I love using cookie scoops. They make all of my meatballs or cookies or cake balls all the same size. It makes my OC self happy. 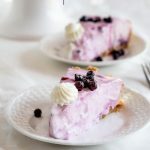 Nordic Ware Natural Aluminum Commercial Baker’s Jelly Roll Baking Sheet – These sheet pans are durable and I have four of them so I can get all of my cookies baked in a jiffy! White Cheddar Meatballs are perfect for dinner or a cocktail party. The sweetness of the bbq sauce contrasts perfectly with the cheddar cheese. Heat skillet over medium-high heat. Add breadcrumbs; cook until toasted, stirring frequently. Remove to a large mixing bowl. Coat skillet with non-stick cooking spray. Heat over medium-high heat. Add onions and saute until browned and softened. Add garlic and saute for another minute. Shape into12 meatballs and place on foil-lined rimmed baking sheet or on a broiler pan coated with cooking spray; spread remaining barbecue sauce over each meatball. Bake 25 minutes or until done. These meatballs taste like something that’s going to be hard on the waistline. Instead, they’re tender and delicious and baked with no guilt added. These looks so good! I love homemade meatballs! Thank you! I do too and don’t know why I don’t make them more often. Thanks for visiting! I am a sucker for white cheddar! 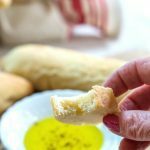 It is quickly becoming my favorite cooking cheese for sure! It is so silky when you heat it up! These meatballs look amazing! I can practically smell them cooking right now. I love the rustic metal dish and fork in your photo..they really make the meatballs pop. Thank you so much. The meatballs were delicious and very easy to make. I appreciate your photo compliments. I’ve been working on improving my photography a bit. This looks interesting- would love to try with veggies. . I love the fact that they are not fried – love it! I will definitely try to make them, maybe this weekend. Easy and yummy Ana! I agree about the frying. I don’t use that technique much. These look so good, Julie! And I am SO hungry right now! Will these make an appearance on your table for Super Bowl? I bet they are so cheesy when you bite into them! I really love a good meatball. My girl friend and I got together a couple of weeks ago and made probably 300-400 tiny meatballs for Italian wedding soup! After that we vowed to have meatball rolling night more often! We will add these to the roster! I love that a meatball rolling night! They are cheesy yummy! Thanks Tracey. We aren’t doing much for the game but my hubby and I usually make a nice Sunday dinner together and enjoy a bit of vino. How about you? I am hoping someone invites us over! I am officially partied out! What a great twist on meatballs. Julie, these look delicious! I’m definitely saving this recipe for my next meatball recipe to try. What would you recommend serving these with? Katie, I apologize for not responding earlier. Not sure I am loving the new WordPress comment system. You can serve these like you would meatloaf. Maybe with potatoes or a pasta or veggie? You could also make them as an appetizer. Thank you for visiting! Thank you! We really enjoyed them. I feel comforted just reading about these meatballs. Thank you Tracy! They were very good and reheated well as leftovers! Those are some beautiful meatballs, your photo’s are gorgeous and the meatballs with the BBQ sauce sound amazing. Thanks Suzanne! They are delicious! These sound fantastic. I love Tillamook cheeses too. Me too Jamie! I wish we had a distributer of their ice cream! These look like the ultimate comfort food! Amazing! We really liked them a lot Sarah! They make such great leftovers too! Delicious and easy. Just the way I like them. Thank you! They are so easy and I don’t know why I don’t make them more often. Anything with melty cheese has me cheering! These look delicious. I like the idea of precooking the onions, I’ve never liked the partially cooked onions in meatballs. Thanks Liz. I agree about the onion. I don’t want a big bite of onion. It changes the flavor. Thank you Nancy! My photography is a work in progress so I really appreciate the comment! Have a great day and thanks for stopping by. This is fantastic Julie! We are on the same radar today. Yesterday I made vegan barbecue sauce at home and will put it to work today. Your pictures looks gorgeous and bang on “to the point”. Love it! Thank you Sonal! We’ve had some good weather and that definitely puts me in the bbq mode. Thank you for to picture comment. I’m trying to learn more about my photography.